A nurse is accused of poisoning a wealthy woman but Perry suspects the dead woman's husband instead. Why? Because the man's first wife died of a poisoning also. CARS: No cars. From The Cars by Greg Cockerill. Sightings: Our dark-complected friend who attends so many of Perry�s trials is again present in the gallery at the trial. He sits just over Perry�s left sholder. Submitted by PaulDrake 33, 6 August 2009. + Read about the Pencil Mustache Man and all the other favorite frequent faces here. Submitted by gracep, 11/3/2010. ++ In court, we find the Distinguished Gentelman #1 as the court reporter and Sasha Magaloff and Little Old Lady #2 are in the Jury. Distinguished Lady #4 and Little Old Lady #1 appear on Perry's right side. Submitted by BigBill767, Nov 11, 2016. Uncredited Actors: Don Anderson once again plays a spectator at the trial. As in the last episode, he�s in the last row on Burger's side. Submitted by FredK, 3 Nov 2010. Nora Mae Quincey fluctuates wildly between lucid and demented, playing checkers with chessmen and speaking to an invisible companion. I would say that dementia is not a good trait for a nurse. Submitted by PaulDrake 33, 6 August 2009. + I think she was just lonely. Submitted by 65tosspowertrap, 4-18-14. This episode of Perry Mason (TCOT Fiery Fingers) is based on an Erle Stanley Gardner novel of the same name. The season seven episode titled TCOT Woeful Widower (#204, 7.23) is also based on this same ESG novel. So this seventh season episode is often considered to be a "re-make" of TCOT Fiery Fingers. See repeated episodes here. Submitted by Charles Richmond, 25 April 2013. Major movie actor Edward Norris makes his first of two appearances on Perry here playing George Gordon. Shortly after his second appearance on Perry in 1962 at the age of 51, Edward Norris retired from acting and lived out the last 40 years of his life out of the limelight. Lucky man, Edward Norris was the first husband of the beautiful Ann Sheridan. Submitted by PaulDrake 33, 6 August 2009. Veteran character actor Charles Lane makes his only Perry appearance here as Doctor Williams. When he died in July 2007, Charles Lane was 102 years and 6 months old, making him, as far as I can ascertain, the second oldest Perry alumnus. Charles Hamilton, (still living), �TCOT Posthumous Painter,� at 106 is the oldest alumnus. Submitted by PaulDrake 33, 10 December 2009. + NOTE: Chuck Hamilton died the day before Christmas, 1978, at age 75. Submitted by cgraul, 11/3/2011. The short establishing shot presumably of Sierra City after Paul�s flight appears identical to that of Pinewood seen in #26, �TCOT Half-Wakened Wife,� and Sierra City in #45, �TCOT Buried Clock.� Pinewood here. Sierra City here. Submitted by daveb, 3/6/2011. 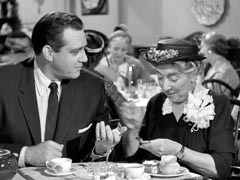 Syndicated cuts: Nora Mae telling Perry she put the pills (with tonic and honey) in the milk because she was afraid Gordon would call the police if she didn't; Mason asking Vicky if someone could have gone in Mrs. Gordon's room after she was asleep and added the arsenic to the milk, Vicky answering yes; Gertie answering a call and eating chocolates and Drake entering; Drake flies to Sierra City, sees Dr. Fremont about Grace Gordon's medical history. Additional Hallmark cuts: Nora Mae asking Perry isn't it a pity about the Gordons, Mason asking her why she hasn't told the police, Nora Mae saying they were busy and she never got a chance to show the pills to a Sgt. Wallace; Mason asking Vicky if George would have been penniless if the will had been changed, Vicky answering that was the intention, Mason asking if he was faithful, Vicky answering he had a girlfriend named Charlotte (last name unknown) and she didn't think he has seen her in months because he rarely left the house; Mason reading aloud Drake's report "Grace Gordon deceased"; Burger's opening statement; Mason's cross-examination of Dr. Williams; Tragg testifying that he found nothing to indicate Mrs. Gordon took the arsenic herself; Mason asking if Tragg agreed that Nora Mae would have handled the household chemicals in the course of her duties, Burger objecting, judge sustaining and telling jury to disregard; Gordon testifying that Nora Mae was quite anxious to help him with Burger stating that she did it so she could later blame Gordon, Mason objecting, judge sustaining; Mason asking if he saw "Mary Smith" a good deal, Gordon answering no, only a few times and that it was casual; Mason finishing his question to Dr. Meecham that there was no trace of arsenic or other poison, doctor replying that was also correct; asking the doctor if he was incorrect when he said there was no trace of arsenic or other poison, the doctor responding he was correct just not asked if we could have found other poisons, Mason stating he has been asked now and the doctor saying he's been asked and he answered. Submitted by Wiseguy70005, 8/01/12. It's for you, Mr. Mason: Perry's at the stately Gordon residence when the maid tells him Paul Drake's on the horn -- but he doesn't take the call this time. Submitted by francis, 6/16/14. +Interesting that the camera "slowly and silently pans the 'entire room'" but stops short of showing Della. jfh 22May2017. Della and Perry handle the pills with their bare hands, apparently unconcerned that they might be poisonous. Second episode in a row--and at least the sixth so far--featuring an affluent, childless, unhappily-married couple. Submitted by 65tosspowertrap, 4-18-14.